Is there a better alternative to MOOS Project Viewer? 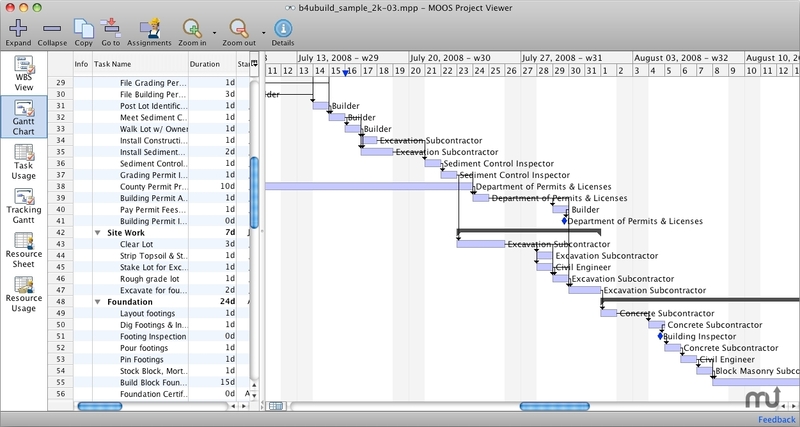 Is MOOS Project Viewer really the best app in Project Management category? Will MOOS Project Viewer work good on macOS 10.13.4? MOOS Project Viewer is a Microsoft Project viewer that can open any MS Project file type (.mpp, .mpt, .mpx, .xml) for any Microsoft Project version (2000, 2003 and 2007). Available views: WBS, Gantt chart, task sheet, resource sheet, resource usage. It is running on any Java enabled platform including Windows, OS X and Linux, and it is the perfect solution for project stakeholders to view the project details in a dynamic way. No need to work with printed materials or static reports in different formats (HTML, PDF, Excel, etc.). MOOS Project Viewer needs a review. Be the first to review this app and get the discussion started! MOOS Project Viewer needs a rating. Be the first to rate this app and get the discussion started! Using MOOS Project Viewer you can see project details that no other report can give you. You can zoom in/out, collapse/expand, show/hide, resize, etc. Hence you get a powerful tool with a strong configuration to view any Microsoft Project file.